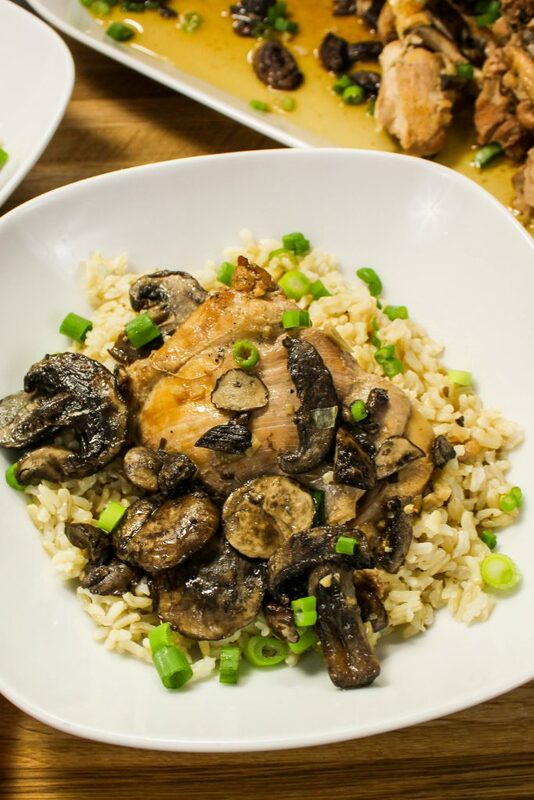 Slow Cooker Adobo Chicken and Mushrooms is chicken thighs & mushrooms cooked low & slow in a delicious blend of Asian flavors. Weight Watchers friendly- 9 SmartPoints! Just because it’s almost spring (and feels like spring!) doesn’t mean you have to put your crock pot away in storage. Typically during the fall or winter, my crock pot is filled with soups, stews, and chili. While these dishes make winter bearable, I also love meals I can make in the crock pot all year round. My Slow Cooker Adobo Chicken and Mushrooms is a hearty and healthy slow cooker meal great for any day of the week. 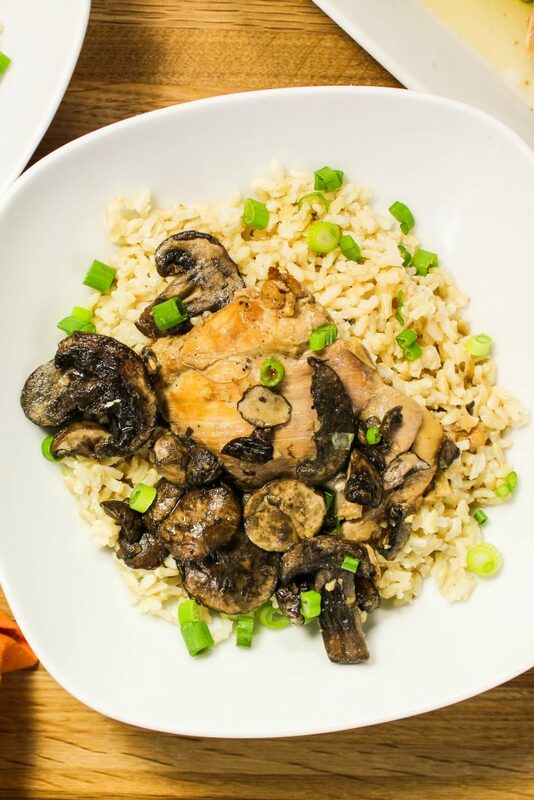 Chicken thighs and mushrooms cooked low and slow in a delicious blend of Asian flavors and served over rice. This is a Weight Watcher friendly recipe and each serving is 9 SmartPoints. Crock pot meals can be a real time saver during a busy week. There’s nothing better than coming home after a day of work to a meal that’s basically already cooked and ready to eat! During the winter, I am using my crock pot several times a week to make soups and stews. One of the many things I love about a crock pot is how versatile it is, meaning that you can cook more than just soups in it. I love making meat in a crock pot and make shredded chicken almost once a week. My inspiration for Slow Cooker Adobo Chicken and Mushrooms is my love for Asian food… and mushrooms. My husband and I moved to Indianapolis last August and have been blown away by how many amazing Asian restaurants there are in this city. Each time we go out to eat (which is about once a week… I need a break from cooking sometimes! ), we usually go for Asian food. I’m always left feeling happy, full, and inspired to make something like I ate in my own kitchen. Asian food is complex and packed with amazing flavors. This recipe is inspired by a chicken and rice stir fry I had a while back that was packed with mushrooms… one of my favorite ingredients! This dish is basically Chicken Adobo, which is Filipino style chicken. Adobo chicken is essentially chicken cooked in soy sauce, vinegar, and garlic served over rice. This recipe calls for chicken thighs rather than chicken breast. Every time I cook with chicken thighs, I tell myself “I need to cook chicken thighs more!” Chicken thighs are so good… they are super moist when cooked and hold in flavor really well. 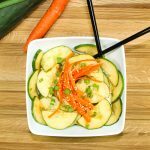 A great thing about this recipe is you just dump all the ingredients into the crock pot and let it cook while you are away! There very little prep work involved, which you could do the prep work the night before then have everything ready to add to the crock pot the next morning! Heat a cast iron skillet over medium high heat and sear chicken thighs for about 5 minutes on each side. Searing meat before adding to the crock pot adds a nice depth of flavor to the dish. To a crock pot add the chicken thighs, minced garlic, chicken broth, soy sauce, rice vinegar, mirin, ginger paste, and bay leaves. Cook on low for 8-10 hours (or 4-6 hours if you are in a time crunch). Add sliced mushrooms to crock pot and cook for another 30 minutes. The mushrooms are probably my favorite part of this meal. They cook for 30 minutes in a delicious broth and come out so juicy and tender, it’s hard to believe how easy it is to make them! 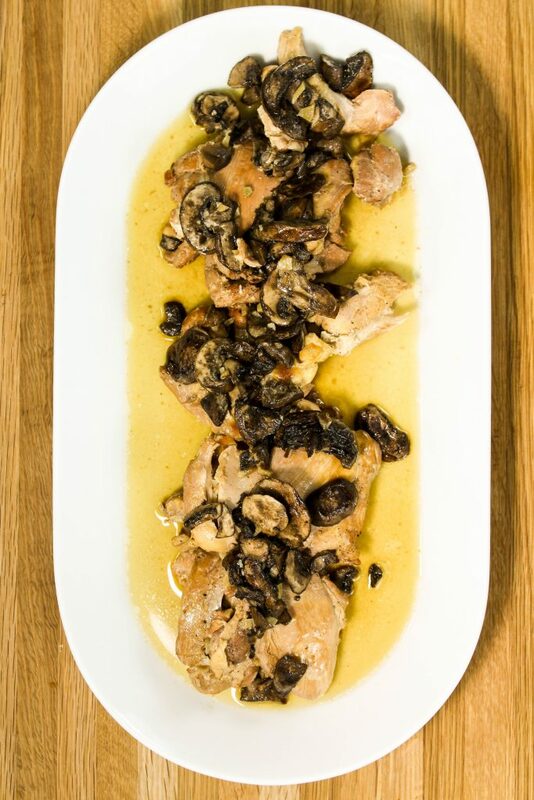 Remove chicken thighs and mushrooms from crock pot and set on a plate to rest. Slow Cooker Adobo Chicken and Mushrooms is a great meal for any day of the week. 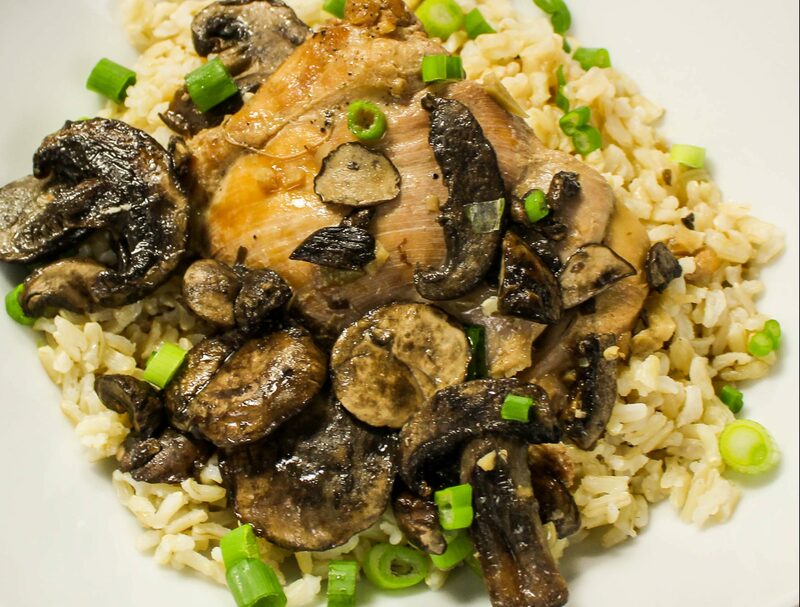 Chicken thighs and mushrooms cooked low and slow in a delicious blend of Asian flavors. I like to serve mine over brown rice and garnish with green onion. Hearty and healthy with less than 12 grams of fat and 9 Weight Watchers SmartPoints per serving! Heat cast iron skillet over medium high heat, add oil and cook for 1 minute. Add chicken thighs and season each side with salt and pepper. Cook on each side to get a sear for about 5 minutes. To a crock pot, add seared chicken, minced garlic, chicken broth, soy sauce, vinegar, mirin, ginger paste, and bay leaves. 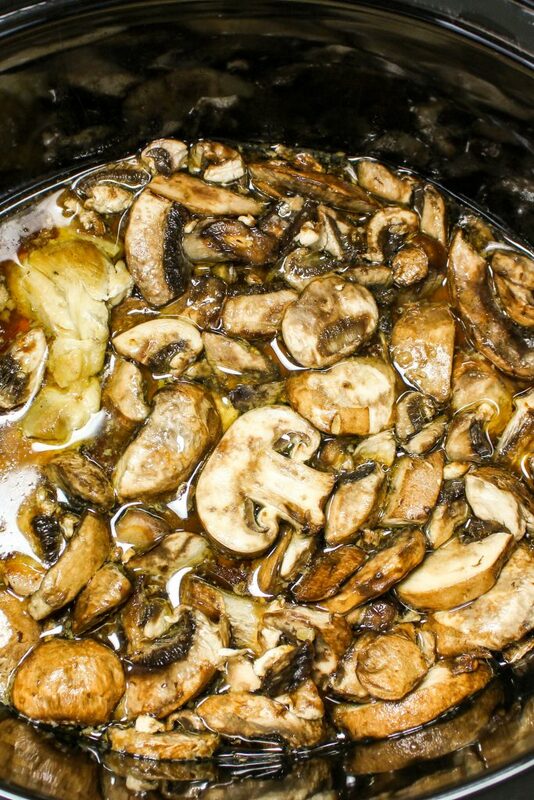 Add mushrooms to crock pot and cook for another 30 minutes. Remove chicken thighs from crock pot and set on a plate to rest. Serve over brown rice and top with liquid from crock pot. 1/2 Cup of cooked rice per serving! 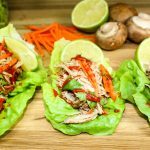 March 9, 2017 at 1:50 pm This looks delicious and I love that it's healthy! March 10, 2017 at 8:40 am It's a winning combo... delicious and healthy :)! Thanks Devin!! March 9, 2017 at 3:20 pm This sounds so good! March 10, 2017 at 8:40 am It really is! Thanks Ana! March 9, 2017 at 3:53 pm This looks absolutely delicious! And only 9 WW points is awesome. I love cooking with boneless thighs as well, it gives you so much more flavor. I'm definitely going to try this one. March 10, 2017 at 8:39 am I know! It's a great and filling dish for only 9 points! Chicken thighs are the best :). Thanks so much Andi! March 10, 2017 at 8:38 am Slow cooker meals are the best! Thanks so much Candy :)! March 9, 2017 at 6:00 pm I'm Filipino and I love chicken adobo! I'm going to try this recipe...looks so yummy! Thanks for sharing! March 10, 2017 at 8:37 am I hope this recipe is close to the authentic version!! Thanks so much Kaycee :) ! March 10, 2017 at 8:37 am I love a good chicken and mushroom dish :). Thanks Rose! 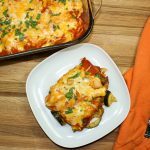 March 9, 2017 at 9:33 pm Your plating is stunning - and the dish looks delicious!! Must try! March 10, 2017 at 7:53 pm Wow this looks so delicious, juicy & tender chicken and mushrooms taste amazing together! March 12, 2017 at 3:43 pm It's such a great combo! Thank you for checking this recipe out Addy :)! March 14, 2017 at 11:30 am This is amazing!!! I love a good slow cooker recipe :) Thanks for sharing! Saves me so much time during the weekday! March 14, 2017 at 4:52 pm The slow cooker is my best friend! Thanks Divya! March 16, 2017 at 9:26 pm I don't often find Asian ingredient combos like this for the slow cooker. I'm a huge mushroom fan and love the look of this. The fact that its low cal is a total bonus! Can't wait to try it out.